Brick Town Talk: GE 10211 - Wow! - LEGO Town, Architecture, Building Tips, Inspiration Ideas, and more! Really hard to see (sorry) but there are trans clear lamp holders! Click here for a clearer picture. I believe that is a new colour for this piece. Thanks for the review Brick Street! 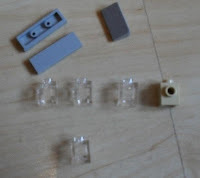 What's the use of the clear headlight bricks? To make the case for the diamonds. I'll take a pic later.